As a parent, you both love and dread summer. It gives you and your kiddos a chance to spend some quality time together, get out in the gorgeous weather, and take part in fun summertime activities. On the other hand, it means your children are no longer in school and end up complaining about being bored and having nothing to do. 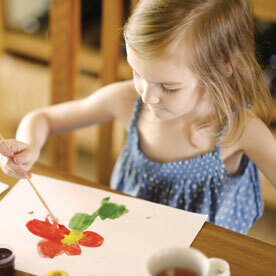 You love that your children get a break from school but you don’t know how to help them stay entertained and active. Technology has taken over and it is hard to even get kids outside nowadays. Planning different activities for the summer can help keep your children stay active and entertained without being “bored.” while it may be hard to plan so many activities, just remember they don’t have to be elaborate. They can be as simple as running through the sprinklers. 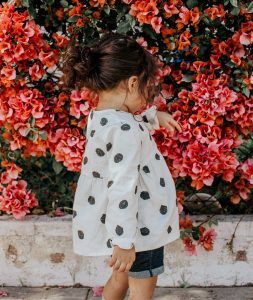 The trick is to plan fun things that your children will love and enjoy, so that you can sit back, relax, and let them play. In this blog we will give you different ideas for you and your children to stay active and entertained all summer long! Start planning now, it’ll be here quicker than you think. If you already have a trampoline sitting in your backyard, you know how it can provide hours of endless fun. If you don’t currently have one, investing in one will get your children excited and will likely get them outside and playing for hours. If you have noticed that your children are no longer playing on the trampoline like they used to, add different elements to your trampoline to get your children excited again. Place the hose with a sprinkler attachment underneath the trampoline to add a unique twist. Jumping and playing on a wet trampoline is fun and perfect for hot summer days. This is a better idea for your older children since the trampoline can become slippery. You will also want to supervise your kiddos to make sure everyone is being safe. Adding water balloons to the trampoline is another fun idea. 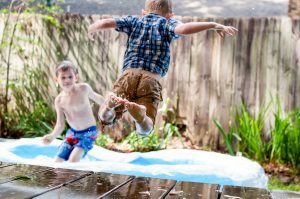 Your children will feel like they are in an action movie as they try to dodge the water balloons bouncing around with them. Summer and water go together like peanut butter and jelly. There are endless activities and fun that can be had with water — water balloons, kiddy pools, Slip ‘N Slide®, water guns, crazy sprinkler attachments, the list goes on and on. Water sports and toys are fun for kiddos, get them outside, and help cool them off in the hot sun. You can make up games for them to play, set up an obstacle course, or just have a fun water gun fight. Another fun and simple game to play with water is “Mother May I.” In this game the parent can be “Mother.” Stand at one end of your yard and have your kids stand at the other. They will take turns asking you if they can take different steps (scissor steps, bunny steps, baby steps, etc.) to you by stating “Mother may I take four baby steps?” or something similar. You decide if they can or not. If you decide that they cannot take the steps towards you, spray them with the hose and send them back to start. The first of your kiddos that makes it to you wins, just don’t play favorites! 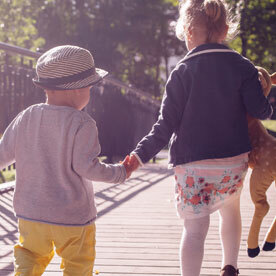 If you are a super parent, planning a scavenger hunt can be a fun and exciting thing to do with your kiddos. Place clues around town that will take them on nature walks, to cool places around your home, and allow them to explore. If you are not that creative or don’t have enough time, that is okay! You can have fun adventures without setting an elaborate plan. Take your children to different natural areas and allow them to take it all in. Go on natural walks, go on an adventure through parts of town you have never explored, and just let them run wild! Well, maybe not wild, but you get the idea. This is a fun way for both you and your kiddos to learn more about your home and get out of the house for a few hours. Not only will your yard look better, but your kids will love seeing their hard work all summer long. Whether you plant flowers or vegetables in your garden, your children will have fun being part of this task. They will like watching their plants grow and may even start eating the vegetables they grow! That is a win-win. Another fun idea is to buy a bunch of ceramic pots and paint. Have your children paint their pots and then plant flowers in them. You can place them all around your yard to add color and a personal touch to your landscaping. Your children will be proud to point out their pots to friends and other family members. Camping is fun, but if bringing your children on a full-on camping trip is something you are not ready for, start by camping outback. This is fun for you and for your kids. Set up a tent, start a campfire (in a fire pit), bring snacks, tell stories, play games, and spend the night outside under the stars. This could be a fun way to prepare for a real camping trip and help your children know what to expect. 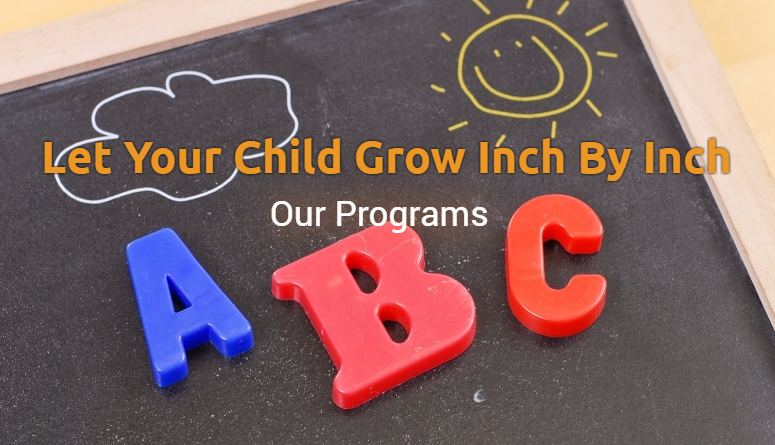 At Inch By Inch Child Care, we know that you are likely working adults who can’t take the entire summer to spend with your children. That is why we offer a summer camp for children from five-years-old to fifth grade. Our summer camps are fun and offer hands-on activities for your kiddos. 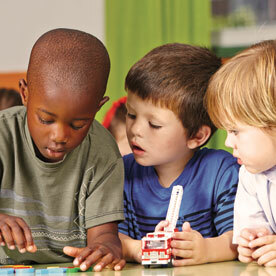 We will bring them to explore their home town, take them on fun field trips, and keep them entertained all summer long. This is a great option for you if you can only spend a few days or weeks with your children this summer. Our summer camp starts June 25th and ends August 29th. Your can enroll your children for the entire summer or only a few weeks! You can learn more about our summer camp and the schedule as well as get your questions answered. 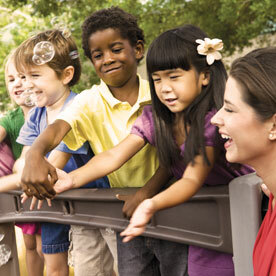 Summer is a fun time for children, as long as they stay active and engaged. Whether you have great plans for your summer spent with your kiddos or you want to enroll them in our awesome summer camp, we are sure this will be the best summer yet! Contact Inch By Inch to learn more and register for summer camp today!